For the first time in 150 years, and after more than 50 years of conservation efforts, the number of saddleback giant tortoises appears set to recover on Pinzon Island in the Galapagos archipelago. During a recent visit to Pinzon, an ESF conservation biologist and two colleagues found 10 tiny, newly hatched saddleback tortoises living on the uninhabited island 600 miles west of Ecuador. Given the hatchlings' small size and camouflage coloration that makes them difficult to spot, there are almost certainly many more than 10, the researchers wrote in a piece published in the journal "Nature." The scientists believe the discovery shows that the species is able to reproduce on its own in the wild after the population dwindled to about 100 in the 1960s. The tortoise population had been nearly wiped out by early whalers and pirates who hunted them for food and by non-native rats that arrived on sailing ships. 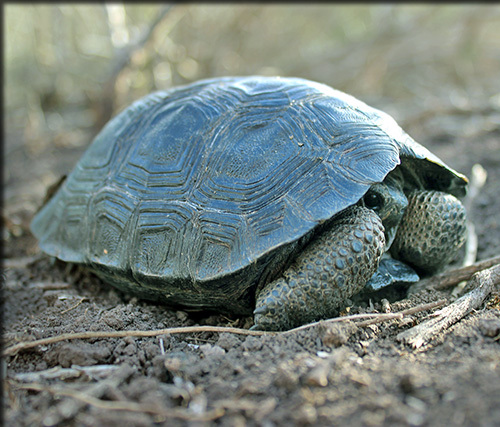 The Galapagos National Park and its collaborators set up a program to save the tortoise in the 1960s. This involved collecting eggs and raising hatchlings in captivity for four to five years so they could grow large enough to survive in the presence of the rats. Extensive rat-eradication measures helped reduce the threat from the rodents. The saddleback tortoise is named for its saddle-shaped carapace. Their relatively long necks and limbs provide an advantage when seeking food. The ESF researcher on the project is Dr. James Gibbs, a professor of vertebrate conservation biology. He wrote the "Nature" piece with Washington Tapia Aguilera of the Galapagos Conservancy and Jeffreys Malaga of Galapagos National Park.